Design outside the (big) box. Don’t limit pet-friendly home décor purchases to mass-market pup products. For example, rather than choose a dog bed that doesn’t fit your style simply because it’s a “dog bed,” select a large floor pillow that complements your décor. Or, look online for unique pet products that feature prints and patterns that mesh with your design aesthetic. Check out our modern dog beds here! Integrate storage solutions. Dogs require a lot of stuff: leashes and collars, toys, bowls, treats, more toys, and so on. Utilize design-friendly storage bins to corral and conceal the clutter. Stow dog toys in pretty baskets or bins that blend into your living room but are accessible to your dog. Hang leashes and outdoor apparel by the door on hooks or, if it fits your existing décor, consider unique storage solutions like a vintage hat rack. Find our favorite storage ideas here. Eat, drink, and be sanitary. Feeding and water stations can be messy, especially when dishes are left out all day. Feed your pup’s meals in a stylish ceramic bowl, then load it straight into the dishwasher. It’s the simplest solution to keeping a feeding area clean. Water, though, must be fresh and accessible all day. If you have an accessible area that isn’t part of your main living space – say, a mudroom or laundry room – you can conceal water dishes there. Otherwise, choose a bowl that fits your kitchen’s theme, and purchase a coordinating placemat or doormat to keep splashes and slobber off the floor. Tuck it into a corner and refill as needed. Convert wasted space. In the midst of a remodel? Or feeling a DIY? Hollow out the space under your staircase to create a tucked-away dog haven. This is a popular Pinterest project with tons of options, including adding a little window for your pup to look outside. Furnish wisely. Black and white work perfectly together… unless it’s your black Lab snoozing on your white couch. Select larger pieces with your dog in mind. Machine-washable slipcovers make shedding manageable if you’re willing to launder them regularly. Otherwise, utilize throw blankets that can be removed and tossed in the wash, especially before company comes over. Accent away. Home décor accents add layers and texture to your space. Throw blankets and pillows in patterns you love add a dash of (washable) embellishment. Likewise, vases and interesting containers spice up your design, as long as you place them above exuberant-tail-wag height. And don’t forget your walls! Commission a portrait of your pet that accents your existing décor – like a pop art print for a modern home or an oil for a traditional look. It is possible to have a dog-friendly home that is also well-designed. 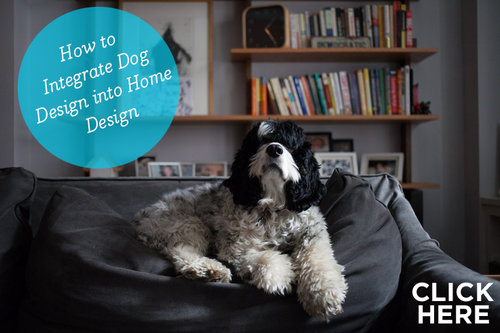 Focus on a few key design details, but don’t forget the best accent of them all: your darling dog!